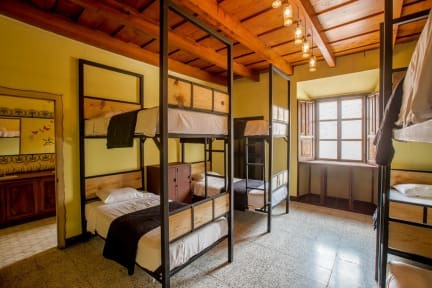 The latest Bigfoot Hostel is found in Antigua, Guatemala. A beautiful, spacious property, offering super fast WI-Fi, clean hot showers, a vibrant bar and a restaurant. We’ve even got a brand new, clean and warm jacuzzi to warm you up after your volcano hikes! The hostel has beautiful Antiguan courtyards that make it easy to meet and mingle with fellow travelers. Our bi-lingual staff can provide you all the information you need about Antigua and help you to find the right shuttle to your next location. We can connect you to all over Central America. On top of this, the tour agency we run from the hostel will make sure you do every volcano hike, mountain bike trek, city tour or spa treatment that you want - and all at very reasonable prices. The location is in the heart of Antigua, near to lots of great restaurants and cafés. We're centre to the vibrant nightlife of the city within walking distance to every club and bar. We are close to the cathedrals, old churches and plenty of other monuments. Bigfoot Antigua is conveniently located one block from Parque Central - the central park of the city where you can experience the true Antiguan street culture. All of our rooms are clean, spacious, comfortable, and well decorated. Every dorm is equipped with Air-conditioning and backpack size lockers. 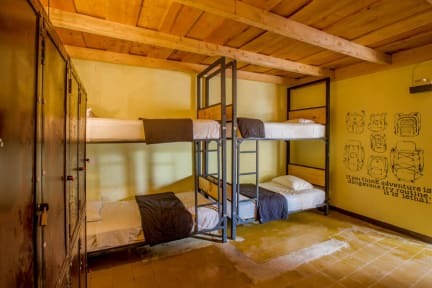 We have mixed dorms, a girls-only dorm and beautiful private rooms available. * We do not accept customers younger than 18 years of age. This is my 4th time staying at Bigfoot! This time with my boyfriend. It is one of my favourite hostels out many around the world. The staff is incredible, so helpful and a lot of fun as well! I call many of them friends now:) Everything is super clean, the rooms are awesome, and stay dark in the morning if you want to sleep in. The food is also so good and the atmosphere is so friendly. I can go on and on about this place. We’ll definitely be going back! Thanks so much Bigfoot family!!!! Its a good hostel to stay at. Lots of tourists. Easy to meet people. Good food. Inexpensive. Clean. Great backpacking hostel! Great place to meet people from all over! Super clean and open. You had space to move around or seclude yourself from others which was nice! Overall a great stay! Bigfoot Antigua is an awesome place to stay. The location is so central and easy to navigate around. We really enjoyed the room and the food. It’s nice that it is also a bar so you can come back after dinner and enjoy the good atmosphere. Great hostel for meeting people and exploring Antigua. Clean and feels safe. Loved our stay! Bigfoot is what it is, a party hostel. They don't try to pretend they are anything else so, credit for that. Not really any complaints but, nothing stand out either. If in Antigua again, I would stay at another more chill hostel and just swing by Bigfoot for the parties. Place to go for most evening but not to stay. Sadly the beds are pretty dire. Legitimately only need to sneeze on the top bunk and the whole things shakes. Incredibly uncomfortable. Staff are incredibly friendly though and food isn’t too bad. Our experience with Bigfoot was so-so. The check-in and check-out process were relatively smooth, but the atmosphere can be a bit intense. I've stayed at hostels that accommodate more people, but the 8-bed female dorm felt pretty jam-packed. Bring a personal lock. Our flat mates were kind, but nobody used the lockers so walking around was a challenge at times. If you have to get up early and yearn for a restful slumber, I wouldn't recommend staying here. The amenities and location are great.